On Intuitive Tuesdays I select a card and give you my interpretation of it. On Thursday I select one reader's comment and pull an additional card. I encourage you to read about the additional card I pulled this week and see how it applies to your life. Anything that is brought to one of us is a message for all of us. I certainly know where this conflict lies. And on a logical level I understand the motivations that are causing a stalemate in what was once a strong friendship. But I can't help being mad, still, at the way I have been treated by someone with whom I was very close. I know I should be able to rise above and just forgive and love, but is it wrong to just feel wronged for a little bit? I believe I am usually compassionate for others and their situations, and empathetic toward what they are going through. But I'm just not feelin' it here! Sounds like I have some work to do. Grrrr. I think we've all felt this way. It's hard to accept when someone you have been close to doesn't seem to be valuing the friendship. The card I pulled for you today is The Hermit, which is a card of searching within yourself for answers. This doesn't necessarily suggest an intellectual search as much as an intuitive search. For example, you may be asking questions like, "What happened?" or "What did I do?" or "When was the last time things seemed OK between us?" This approach of logically trying to sort through the events to determine where things went off-track can be exhausting...and non-productive. Because the other person is not included in this analysis, you can get caught up in your own thoughts and paradigms with what is wrong. It can feel like searching for answers in a dark maze. From an intuitive space, you can more easily tap into the energy beneath the situation. 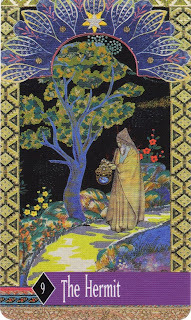 The Hermit encourages you to be thoughtful, patient, contemplative and insightful. Maybe the separation between you has nothing to do with YOU. The Hermit can indicate that s/he is also tuning in and learning his/her own spiritual lesson AND could also prompt you to look at what's here for you to learn as well. When conflict appears in your life, it's easy to take things personally. In this situation, The Hermit encourages you to use your feelings to learn more about yourself. Why does this hurt your feelings? What expectations did you have for the situation that possibly weren't fulfilled? What is here for you to learn not only about how to deal with today, but with the larger theme of conflict in your life? Personal Story: I have two friends right now where I feel a separation. I've been close to each of these women over the past couple of years, but due to a series of events, there is now a gap. I'm not mad at either of them; it feels as though we each need time on our paths to travel alone for a while. Perhaps at some point, we'll be prompted to see each other and may also want to "talk about it," but we may find that there is no "it" to talk about, except for the fact that we noticed the separation. I'm open to engaging with each of them, but am not intuitively prompted to make that happen...yet. We'll see what happens from here. In the meantime, I plan to sit with the energy of The Hermit to learn what lessons are here for me. Take time today -- be a hermit -- to ponder (from an intuitive perspective) any conflicts that are in your life right now. As The Hermit suggests...be patient, be contemplative, be open...and wait. The answers will appear; it's just a matter of time. This is helpful to me, as I prepare to have a conversation with someone, a conversation I'm not sure I'm up to. I will contact you for a personal reading, to help me get to my hermit and intuition in an expedited way. Great story, and good job with Tami. The depersonalization is key, I think. Sounds like a great card for Tami. I've been in this situation, and it is hard not to go on the offensive. Sometimes it is best to go deep for a while first, though. As for me, I am feeling like a bit of a hermit today. We're having our monthly birthday bash in the office today (for and I'm one of the honorees), but I feel like holing up away from the crowd for no explicable reason. As long as they leave me some cake! I need to meditate on the deeper meanings of this card for me. Perhaps logic should not be applied to matters of the heart. I'll try to take Hermit's advice. And I will attempt to depersonalize the situation while moving down from being on offense. I know we are only responsible for our own feelings. She's learning her own lessons, too.